It would be nice to think that your chances of surviving cardiac arrest are approximately the same whether it happens in New York or Seattle or Miami or Detroit. But such is not the case. There is a 46-fold difference in survival depending on what community you live in. Survival, as used here and throughout the book, refers to those discharged from the hospital after an event of sudden cardiac arrest. A series of articles in USA Today published on July 28 and 29, 2003 surveyed 28 EMS medical directors. The reported survival rates from witnessed cardiac arrest with ventricular fibrillation ranged from 3% (Omaha) to 45% (Seattle). An additional 18 communities either didn�t know their rates or refused to report them. A 2004 scientific publication in Resuscitation (a leading journal of cardiac arrest research) found that survival from ventricular fibrillation in 34 communities ranged from 3.3% (Chicago) to 40.5% (Rochester, Minnesota). (2) Since then two studies have set the high end of the curve. (Rea TD, Eisenberg MS, Sinibaldi G, White RD. Incidence of EMS-treated out-of-hospital cardiac arrest in the United States. Resuscitation 2004;63:17-24). A 2006 article in Circulation (the main scientific journal of the American Heart Association) from King County, Washington (the suburban community surrounding Seattle) reported a survival rate of 46%. (Rea T, Helbock M, Perry S, et al. Increasing Use of Cardiopulmonary Resuscitation During Out-of-Hospital Ventricular Fibrillation Arrest: Survival Implications of Guideline Changes. Circulation 2006;114: 2760-5.) Equally impressive is the 2005 report of a 13-year study from Rochester, Minnesota with 46% survival from witnessed ventricular fibrillation. (White RD, Bunch TJ, Hankins DG. Evolution of a community-wide early defibrillation programme: Experience over 13 years using police/fire personnel and paramedics as responders. Resuscitation 2005;65:279-83.) The low end of the curve was set from a 2007 study in Resuscitation reporting the survival from cardiac arrest in Detroit � a nearly hopeless rate of less than 1%. (Dunne RB, Compton S, Zalenski RJ, Swor R, Welch R, Bock BF. 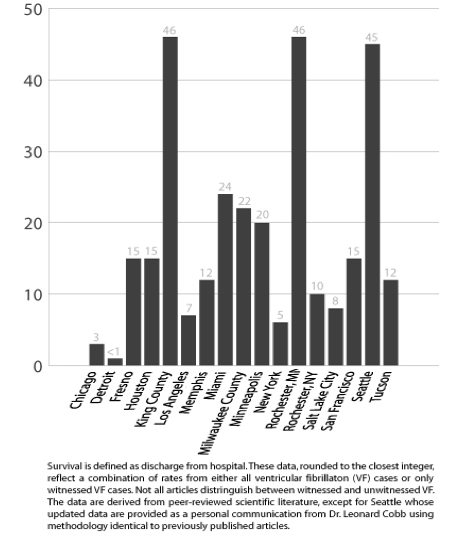 Outcomes from out-of-hospital cardiac arrest in Detroit. Resuscitation 2007;72:59-65) It is not just flip advice to have your cardiac arrest in Seattle or King County or Rochester. You are 46 times more likely to survive compared to Detroit and probably countless other communities. Just imagine a 46-fold difference in the ability of fire departments to extinguish similar house fires or a 46-fold difference in the ability of police departments to solve similar crimes. Would we accept comparable differences in the potency of antibiotics, or Salmonella contamination rates of poultry, or quality of automobile airbags? Consider hospitals� efforts to control hospital acquired infectious, a reporting requirement of the Joint Commission on Accreditation of Healthcare Organizations. Infections are inevitable but monitoring and control procedures can keep the rate extremely low. What if some hospitals didn�t even know the rate of infection? What if some hospitals knew they had a problem but didn�t do anything about it? Now consider cardiac arrest. Most communities do not even know the rate of survival; some know but do little to improve the system. But a few communities know how they perform and keep making improvements. Whatever the service or product, we expect a reasonable standard of quality and a reasonable consistency from community to community. For some products we actually have national standards and national enforcement. But when it comes to cardiac arrest we have no such standards, no agency monitoring the quality of the service, no political groundswell demanding improvements, and no public outcry clamoring for change. © 2019 Survive Cardiac Arrest. All Rights Reserved.